A China Unicom executive has just confirmed that Apple’s next iPhone will be 4G-capable. But surround air quotes around 4G, because we’re not talking LTE: we’re talking 21Mbps HSPA+ technology. In other words, marketing 4G. The info was spotted in a slide photographed by Japanese site PC Watch. 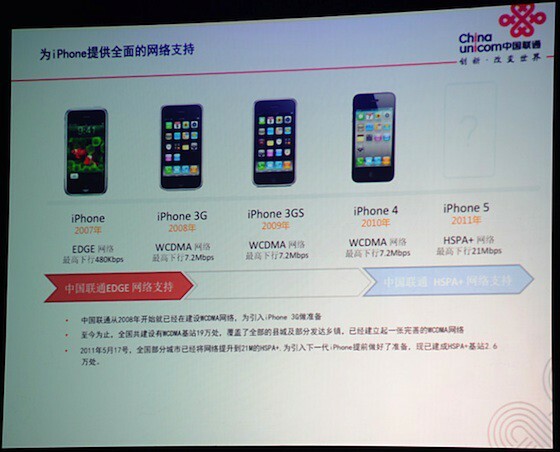 It was presented by China Unicom’s Research VP Huan Wenilang at Macworld Asia 2011. China Unicom is Apple’s exclusive carrier partner in China, so they’d be in a position to know. I’m as annoyed as anyone by the way companies like AT&T perverted 4G to include HSPA+, which is really just supercharged 3G, but even so: this is great news. HSPA+ doesn’t have the battery drawbacks of LTE, and yet offer two-three times the speed of plain old 3G. The only problem? Verizon and Sprint customers are going to miss out. This will very definitely give fifth-gen iPhone owners on Ma Bell’s network a real crowing point.